When you’re in the throes of parenting, it often feels like the exhaustion will never end, but as author and pediatrician, Harley Rotbart, points out, it does, and faster than you think. Therefore, Rotbart offers basic principles and simple strategies in his book, No Regrets Parenting, so parents can appreciate the cherished moments of childhood. If you’re interested in making the most of the 940 Saturdays you’ll have with your kids before they turn 18, then definitely pick up this book. “This is a book about how to prioritize your kids’ needs within your adult schedules,” explains Rotbart. Therefore, using short chapters and a simple structure, he first informs parents what the basic principles of No Regrets Parenting are and then offers strategies to put the mentality into practice. Rotbart believes regardless of what parenting philosophy you subscribe to a single truth applies: Your kids need you to be there. As a result, what it all boils down to is finding enough time. I think that social media does a really good job of “showing off” such “quality” (often costly) moments and so they are needlessly perpetuated. When what Rotbart argues kids really need is for parents to redefine quality time. He claims, “The new ‘quality time’ means meaningful and memorable time, regardless of duration or content.” For the parent of a toddler, he says, it’s sharing kitchen time while the child learns how to finger Cheerios. For the college student, he says, it might be spontaneous calls home. The activity is irrelevant. It’s being present in the moment that matters. Another part of No Regrets Parenting I really connected with was the importance of rituals. Rotbart warns parents not to limit their traditions to big, special occasions. He says parents should be creative, even silly, when instituting such events like movie night. The keys apparently are repetition and anticipation. I know a lot of parents, who skip the anticipation part because if plans change then children are disappointed, but as I’ve found from experience, and Rotbart confirms, the excitement leading up to game night is half the fun. For example, my 12yo delights in the idea of taco night so much she created this mini-menu board for me, using a picture frame (which she saw on Pinterest), so I could write down when it was and she could look forward to it. It’s nothing fancy, and it didn’t cost me any money, but it generates a smile and no doubt a positive memory, which is what No Regrets Parenting is all about. I still recall the pizza nights of my youth with fondness. Finally, I loved the chapter “Their ‘Week at a Glance’” because Rotbart argues, “The truest measure of you as a person may be your calendar.” Except he doesn’t mean it in the way you might think – the more extracurricular activities, community service projects, religious meetings the better. Instead, he asks, “If your calendar were to fall into the hands of a stranger, what would all the entries say about you? Would the stranger reading your calendar recognize how important being a parent is in your life?” And not because of all the places you drive your kids or all the activities you’ve signed them up in but how much time are you spending together? At my house, we don’t play games as often as I’d like, but there’s a lot of laughs during family dinners, thanks to my witty husband, and thought-provoking stories before bed almost every night, courtesy of my fascination with books. Sometimes, it’s only 15 minutes of cuddling and conversing, but since I’ve been doing reading aloud to them for 12 years now, it’s become part of the fabric of our lives that no one (not even my preteen) wants to miss. And this brings me to one of the points Rotbart makes near the end of his book, “One of the harshest realizations for a parent is that young kids often forget those events that are the most memorable for parents.” The extended vacations. The expensive presents. I’ve got scrapbooks, photo albums, and home videos galore, but I think when I ask my kids twenty years from now what they remember most from their time growing up, it will be laughing with dad during dinner and reading books with me. 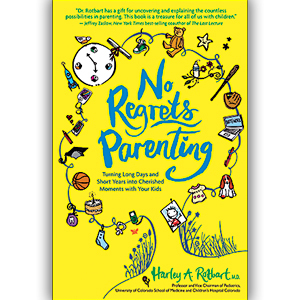 No Regrets Parenting by Harley Rotbart is the kind of book that does a great job of reminding parents to strike a balance between work and family so that there will be time enough for these moments that matter most.